$999.00 Was: $1,099.00 On Sale Now! Drums and percussion are likely the second oldest musical instruments, beaten only by the voice itself. Percussion instruments produce sound by being struck, shaken, scraped or rubbed. Drums are just one member of the percussion family. They refer specifically to instruments with head or skin stretched over a shell. The technical term for the drum head is a membrane, making the drum a membranophone. When you think about drums and percussion, your first thought might go to a drum set with a snare drum, rack toms, floor toms, bass drum, cymbals and cymbal stands. Perhaps you're a hand percussionist and drums to you are bongos, congas, timbales, cajons or even djembes. This just goes to show the wide variety of instruments within the drum and percussion category, and with such a long, rich history it’s easy to see why there are so many variations and types of drum in world. Drums and percussion instruments are the oldest musical instruments in history and haven’t changed much in the course of a few thousand years. One of the oldest discovered drums was made with an alligator skin and dates back to as early as 5500 B.C. Every culture on every continent used drums in some form, whether it was for musical purposes, communication with distant neighbors or relaying commands on the battle field. We've all seen the paintings of the Revolutionary War drummers marching on the front lines, or the ancient hortator keeping time on the Viking longship. However, as technology evolved, so did the drum. The basic principal of every drum is the same: a round cylinder with a drum head—or a drum skin— that you strike with your hand or a drum stick or mallet. The head is held down by a hoop or a rim, and tension rods or rope thread into a lug. The distinction made between drums and hand drums is somewhat obvious. Any drum you play using your hands is a hand drum or hand percussion. Acoustic drum heads vary widely depending on the type of drum they're on. A typical drum set drum uses a drum head made of mylar on the top and bottom of the drum, while hand drums often only have a calfskin head on top. To tune the drum up or down, you tighten or loosen the drum head. The drum shells are constructed from a myriad of materials including wood, metal and plastic, and the different wood species or metals can produce special sounds. Many companies such as DW, TAMA and Yamaha create hybrid drum shells which utilize different tone woods or metal and wood to achieve a unique sound. Wood drum shells are constructed in several ways but the two most common ways are multi-ply construction or stave construction. Multi-ply drum shells are constructed using anywhere from three to 20 thin pieces of wood that are glued and pressed together. Stave drum shells are built using one piece of wood that is typically steam bent into its cylindrical shape. Electronic drums originally started out as simple metronome machines and evolved in the early 1970s into something closer to what they are today. Companies such Roland, Yamaha and Simmons produced the first electronic drum sets. They became popular and commercially successful in the early 1980s as technology and samples became better and more advanced. 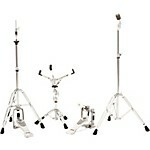 Electronic drum kits or e-kits have a very similar design to acoustic drum sets. There's a snare, toms, bass drum, cymbals and you play it using drum sticks. 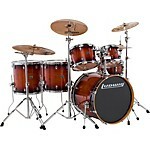 However, electronic drums utilize rubber or mesh heads and the cymbals are rubberized pads. 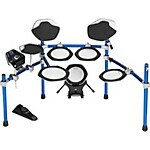 The biggest advantage to electronic drums is the amount of drum and percussion sounds you can program, as well as the built-in, complete drum sets. A typical drum set or percussion setup utilizes cymbals. A drum set includes a pair of hi-hats, a crash cymbal or two, and a ride cymbal. However, experimenting with different cymbal sounds has become very popular and many drummers often have effects—or FX—cymbals in their setup, including china cymbals, splash cymbals and cymbal stacks. Most cymbals are made from bronze alloy and are either machine or manually hammered into their final form.